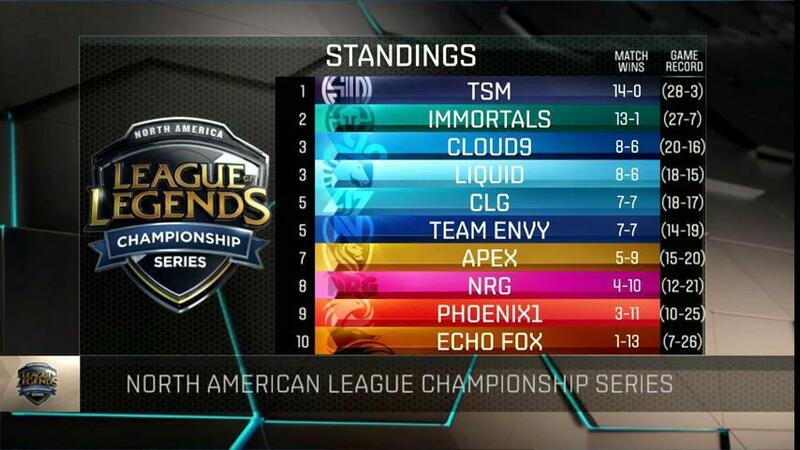 The Summer Split continues with Week 8 of the NA LCS! With the Spring split behind us, the 2016 NA LCS Summer Split features NA's top ten teams - TSM, Cloud9, CLG, Team Envy, Phoenix1, Liquid, Apex, Immortals, Echo Fox, NRG Esports - playing against each other for championship points and a chance to represent their region at the 2017 World Championship! Keep in mind that at the end of the split, the 10th place team will automatically be relegated and the 8th and 9th places will have to battle the top Challenger series teams to retain their spots. LCS Summer Split Week 8 will be played on 6.14 but without the Sona hotfix nerfs. Kennen is disabled. The Ryze champion update is available. Friendly reminder that there are now two dedicated streams for each LCS as multiple games are played simultaneously! For example there is a NA LCS 1 Twitch channel and NA LCS 2 Twitch channel. IMPORTANT: NA LCS Friday matches will begin at 3:00 PM PT starting Week 7 - July 15. As the end of the normal season is quickly approaching, remember that week 9 will be the last week of normal LCS play!